Product prices and availability are accurate as of 2019-04-19 02:52:55 UTC and are subject to change. Any price and availability information displayed on http://www.amazon.com/ at the time of purchase will apply to the purchase of this product. Reading Danna Bodenheimer’s Real World Clinical Social Work: Find Your Voice and Find Your Way is like spending a weekend in a wonderful candid conversation with many of our favorite theorists! ....In language that is accessible, oftentimes metaphoric, and yet not at all simplistic, this book also introduces us to some of the clinical experiences of clients and therapists through an interweaving of their stories and theories. Just prior to presenting us with a thoughtful array of “post graduate options” for further learning and development, Bodenheimer explores the dimensions and dilemmas associated with still-controversial subjects like clients’ transference and clinicians’ countertransference, including feelings of love. 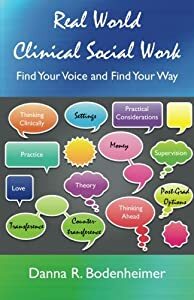 Whether just entering the world of a master’s-prepared social worker or having spent decades as an agency-based or private practitioner, an educator, or an administrator in the social services, spending time with Real World Clinical Social Work is a real gift to yourself and everyone you serve. Danna Bodenheimer's book is the clinical supervisor you always wanted to have: brilliant yet approachable, professional yet personal, grounded and practical, yet steeped in theory, and challenging you to dig deeper.